Located at 8364 Bay Street, Sodus Point, New York on the west side of the Sodus Point Firehall which is on the south side of the road. This mural is next to the Battle of Sodus Point mural. 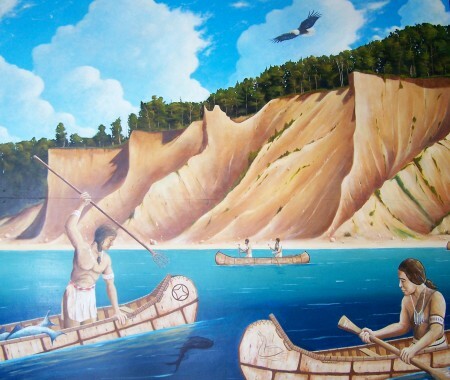 This scene depicts Native Americans in the 1450s spear fishing near Chimney Bluffs. The word “Sodus” is said by most to be derived from the Indian word “Assodorus,” meaning “silvery water.” Two Iroquois Nation tribes (Cayuga and Seneca) used the Sodus Bay area for their summer home due to the abundance of fish and wild game. The Native Americans mostly used Elm bark canoes (depicted in the background) which were locally made, very large, somewhat crude and disposable. They also traded with more northern tribes for the light weight, smaller and beautifully decorated Birch bark canoes depicted in the foreground. The bald eagle, (and their feathers) that is pictured in the mural, are highly revered and considered sacred within American Indian traditions, culture and religion. The bald eagle lives in the Sodus Bay area. The Native Americans vacated the Sodus Point area prior to it being settled by early American settlers in 1794.